Every year at Christmas, Mom usually made Roast Beef and Yorkshire Pudding. Sometimes she'd do a Beef Wellington, but we all loved Yorkshire Pudding so much (and weren't fans of pate) and you need to make a roast to make Yorkshire Pudding, so that was the standard. 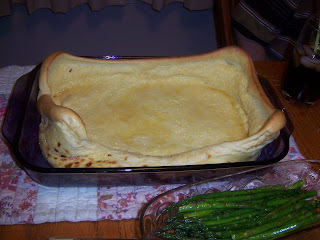 When I moved away from home, I looked in my cookbook to find a recipe for Yorkshire Pudding but there wasn't one. I called Mom, and she gave me instructions over the phone which I scribbled in the front cover of my cook book. To this day, these scribbled instructions are what I follow each Christmas as I make my own Yorkshire Pudding. Don't bother getting a roast less than 5 lbs. Figure 1 lb. per person but get a big one because you can do a lot with the leftovers. Figure 20 minutes per pound, or until the roast reaches 145 degrees. Remove roast from oven, cover with aluminum foil and let "rest". Reset the temperature of the oven to 350 degrees. Beat 3 eggs "to death"
Serve with aspargus and Hollandaise Sauce, red and green pepper jellies, and horseradish cream. *Dad stepped in to make the asparagus. He didn't cook often but he had a few specialties and he took asparagus very seriously. He used an old coffee perculator because he said the asparagus needed to stand while steaming for best effect.